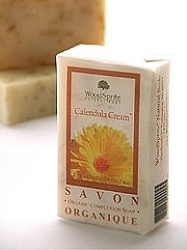 Calendula Cream Complexion Soap is one of our mildest soaps; suitable for those with very sensitive or damaged skin. Calendula is also known as "pot marigold", and has been used for centuries for its mild anti-inflammatory and antiseptic properties. Leaves skin feeling soft, smooth and healthy. Unscented. Ingredients: Saponified oils of *Organic Extra Virgin Olive, *Organic Coconut, Organic Palm, Avocado & *Organic Castor; with *Organic Shea Butter & *Organic Calendula Petals. Unscented. Sensitive Skin. (*Certified Organic)4 oz. wt.